One of my favourites, and as usual will work great with any Britwurst sausage. 1. Bring a large pot of water to a boil for the pasta. 2. In a large heavy based pan, heat the oil over medium- high. Add the sausage, breaking up with a spoon, until browned, for about 5 minutes. Season with salt and pepper. Uncover; add the tomato paste and harissa. Cook, stirring, for 1 minute. Stir in the stock and reduce the heat to low. Let the ragu simmer while you cook the broccoli and the pasta. 3. In a large pan, bring 2 to 3 inches of water to a boil for the broccoli. 4. Salt the pasta water. Add the pasta; cook to al dente. 5. Salt the water for the broccoli shortly before adding it, and cook 3 to 4 minutes. 6. Add 1 cup of the pasta water to the ragu; drain the pasta. Toss the pasta with the rabe and half the ragu. Divide among shallow bowls. Top with a little more ragu; garnish with parmesan and mint. 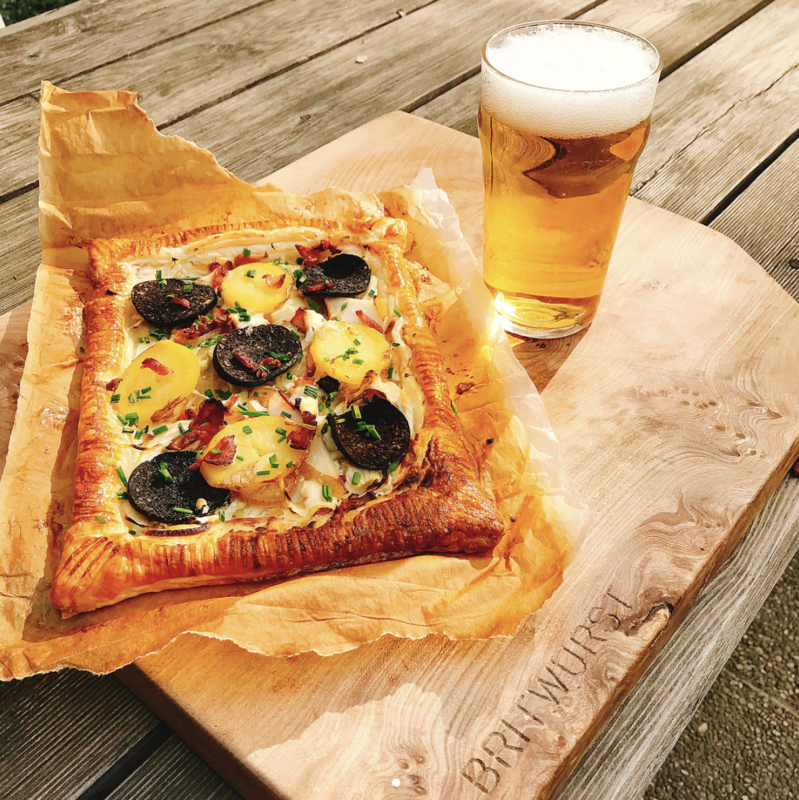 This is a great way to use Black Pudding, for either a quick midweek meal, or how about popping it in the slow cooker for a Sunday lunch treat. 1. Drain the soaked chickpeas, then cover with plenty of cold water and bring to a boil. Simmer for 40‑50 minutes, until tender, then add half a teaspoon of salt to the water, stir and leave to cool. (If you haven’t had time to soak them overnight, add one teaspoon of bicarbonate of soda to their cooking water, and simmer for approximately 80 minutes, until tender). Note: if using tinned Chickpeas this step can be omitted. 2. Warm the oil in a wide, deep pan over a medium-high heat, and add the onions and leek. Season generously, and fry gently for a few minutes before turning the heat down to medium and cooking until the vegetables soften, about 10 minutes. 3. Add the garlic and bay, and cook for another few minutes, then add the tomatoes, black pudding, cinnamon, paprika and two tablespoons of vinegar. Break up the black pudding with a spoon, then cook for 15 minutes, leaving the ingredients to bubble away together gently. 4. Drain the chickpeas, reserving a cup of the cooking water, then fold into the sauce. Taste, and adjust the seasoning, then continue to simmer for another five to 10 minutes, allowing the flavours to mingle. Add a little cooking water if the sauce looks too dry, and the remaining vinegar if it needs more sparkle. Note: if using tinned Chickpeas make sure they are thoroughly washed before adding to the sauce. 5. When you are ready to eat, stir in the spinach and cook for a few minutes, until it has wilted into the sauce. Serve in bowls with lemon wedges, a slosh of extra-virgin olive oil and bread to mop up the sauce. 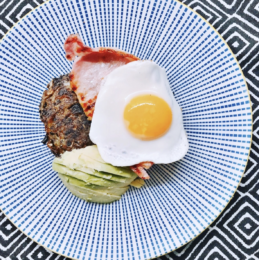 With Black Pudding a staple of the breakfast table I decided to mix it up a little bit, adapting the Austrian style Blunzengröstl into Black Pudding Potato Cakes. 1. Heat oven to 180C/160C fan/ gas 4. Coarsely grate the potatoes into a tea towel and wring dry, then transfer to a bowl. 2. Melt the butter in a large ovenproof frying pan, and add the onion, garlic and black pudding. Cook until the onion is soft but not coloured, about 6-8 mins, then take off the heat and combine with the potatoes and cheese. Season, then bring together with your hands to shape into four generous potato cakes. Put in the fridge to chill for 30 mins. 3. Wipe out the pan, then heat the oil. Fry the cakes until they are lightly brown, taking care when you flip them, for 2-3 mins either side. Transfer to the oven and cook for about 15-20 mins until they are cooked through and crisp. 4. Whilst the cakes are in the oven prepare a fried egg per person and if using, the bacon. Serve piled high, with 1/2 an avocado per plate (if using). This recipe was adapted from BBC Recipes. 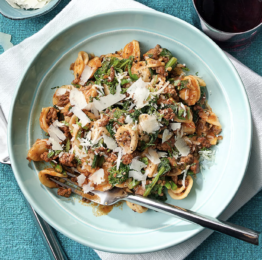 This is a lovely quick and easy midweek meal with little to prepare. Let the oven do all the hard work! *1. Heat the oven to 190C/Gas 5. Score the melanzani flesh in a crisscross pattern but don’t go all the way through. Put in a baking dish facing up, season well and drizzle with olive oil. Cover with foil and bake for 30 minutes (please note this can be done the evening before). 2. While the melanzani is baking, cook the garlic in 2 tablespoons of olive oil, until soft. Add the tomatoes and simmer for 15 minutes until thickened. Stir in the majority of the basil. 3. After 30 minutes take off the foil and pour the sauce over the melanzani. 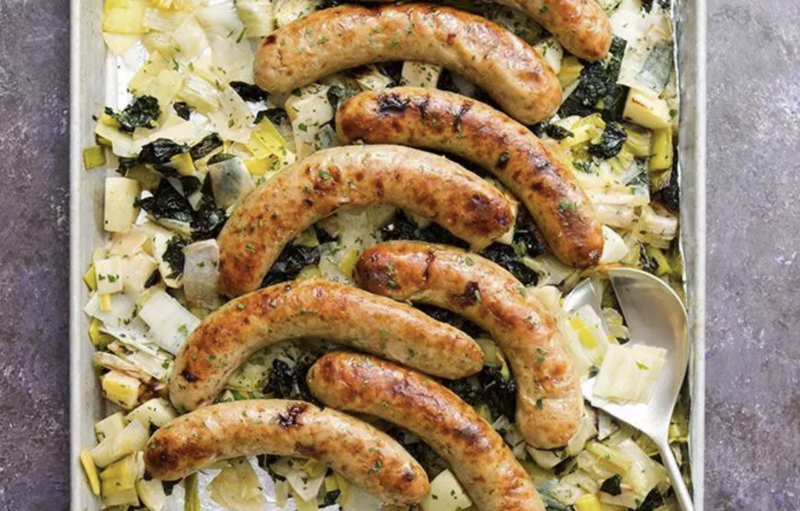 Scatter over the parmesan cheese then bake for another 40 minutes, adding the sausages in a separate baking dish after 15 minutes (if you have a small oven and therefore no space for this, please note that you can also cook the sausages to your liking in a pan). Serve with the rest of the basil and perhaps a slice of thick and crusty bread. This is a great little recipe which I quickly noted down whilst chatting to a chef in one of the many great little local restaurants we were fortunate to find in Rhodes. 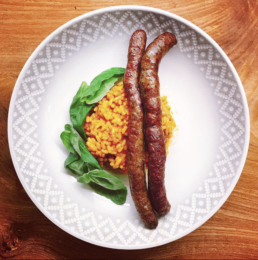 It is suited obviously for the Beef & Feta sausages, but why not give it an Italian twist and use my Italian Salsiccia? 1. Remove sausages from skins and make mix into 6 large balls. Spoon over 2 tbsp of olive oil, cover, and leave in fridge to chill for 30 minutes. 2. 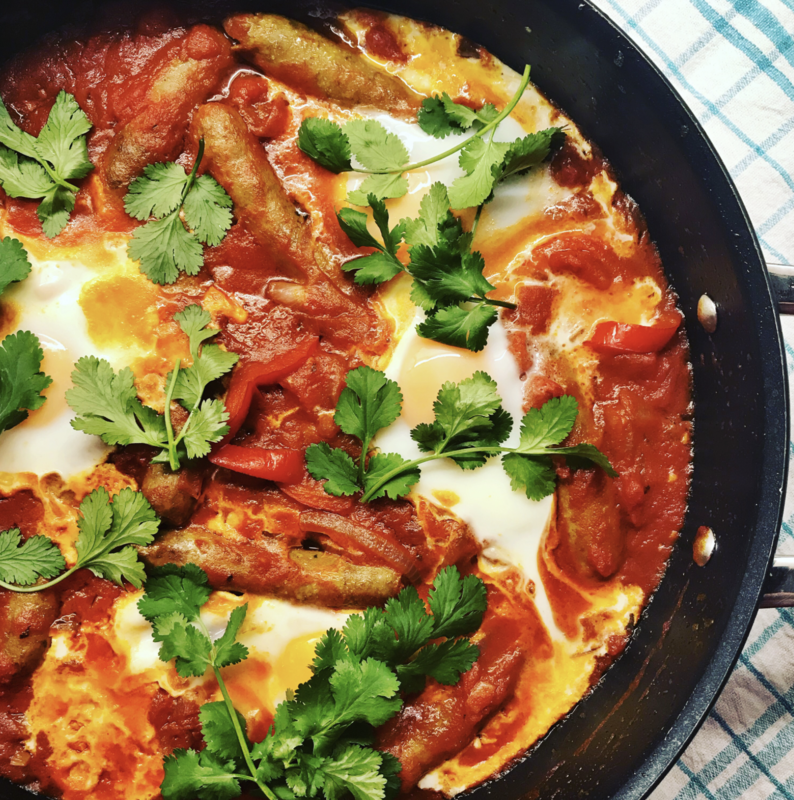 While the sausages are chilling, make the sauce. Heat the remaining olive oil in a large saucepan over medium heat. Add the onion and cook until soft, about 3-4 minutes. Add the garlic and cook for 1 minute longer. Add the wine/water, chopped tomatoes, sugar, and red pepper flakes, and stir. Bring to a boil, then reduce heat and simmer, uncovered, until slightly thickened, about 10-15 minutes. Remove from heat and stir in butter, then season to taste with salt and pepper. Set aside. 3. Preheat the oven to 180°C. Heat a thin layer of olive oil in a large saucepan over medium-low heat. Place some flour on a plate and roll the sausage meat balls in the flour, then fry the sausages in batches, turning over gently part way through cooking to brown on all sides. Once cooked, place the sausages in a single layer in a baking pan, then cover with the tomato sauce. Cover tightly with foil and bake for 40 minutes. 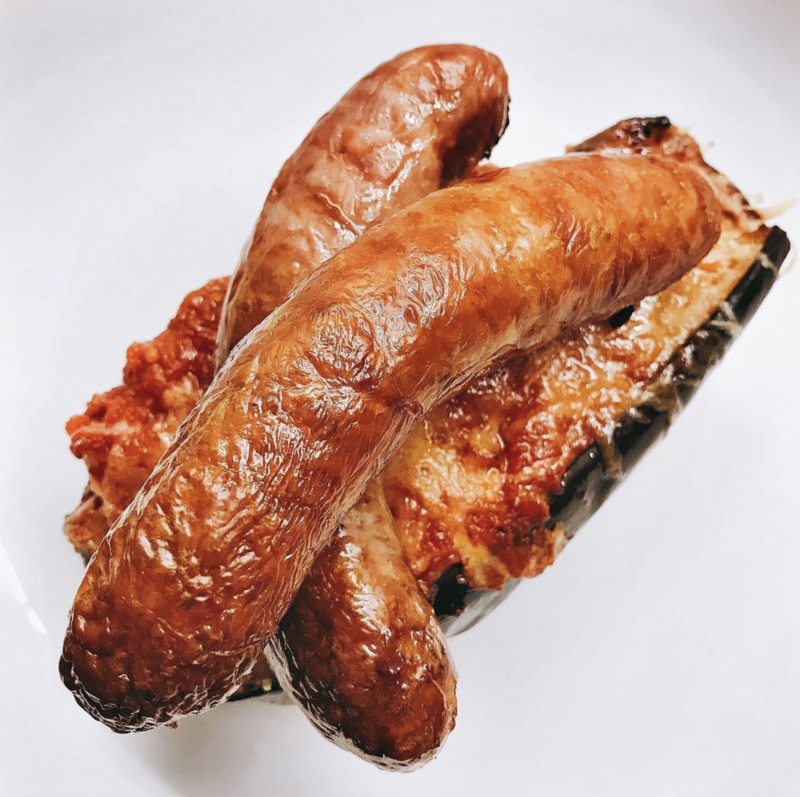 Serve hot, with perhaps some Orzo, Briam, or Lemon Roasted Potatoes if using the Beef & Feta sausage, or perhaps Polenta, Baked Aubergine, or a very basic Risotto if using the Italian Salsiccia. I was so happy with the results of this, and was enjoyed in the sun on a warm Spring day with a nice cold beer. You can find variations of this recipe elsewhere online, but I think my version is the best and is not to overpowering. If you don’t fancy Black Pudding, feel free to use your favourite sausage instead, removing it from the skins before hand and crumbling it into a pan and pre-cooking before adding on top with the rest of the ingredients. Make a cream sauce by whipping the sour cream with the mascarpone (or creme fraiche), the lemon zest and juice, and add sea salt flakes and black pepper to taste. Slice the cooked potatoes and the black pudding into rounds or ovals. Chop the cooked bacon into small pieces. Finely slice the fennel bulb, spring onions and pear. Toss all with a drizzle of the honey, olive oil and chopped herbs. Place the puff pastry sheet on baking paper, spread with cream sauce leaving a space around the edges and arrange potato, pear, fennel, spring onion, black pudding and bacon pieces over the top. Top with extra dollops of cream sauce and a drizzle of olive oil. Whisk the egg in a small bowl and brush around the edges. This is however optional but will give the puff pastry a lovely brown and crispy edge. Bake until pastry is crisp. Serve scattered with snipped chives. This is perhaps one of my favourite recipes and one I am extremely proud of. 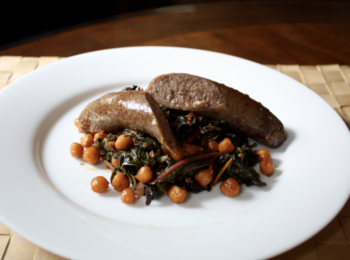 The Lamb & Apricot sausage comes through so great on this and really shows it in its prime. It is so easy to make and will impress anyone who you might be entertaining. As with a lot of my recipes you do not need to use the sausages in the recipe, but I would really recommend it. The apricot really shines through the lamb and tomato sauce. Heat oven to 160C. Remove sausage from its casing and form into small balls/patties (kofte). Heat oil in pan to a high temperature and brown kofte on both sides. Place in oven, keeping an eye on them so they do not over cook. Reduce pan temperature to medium, add onion to the oil left over from cooking the sausages and lightly sauté. Add tinned tomatoes, season, and lightly simmer for 20 mins until the sauce as reduced by a quarter. 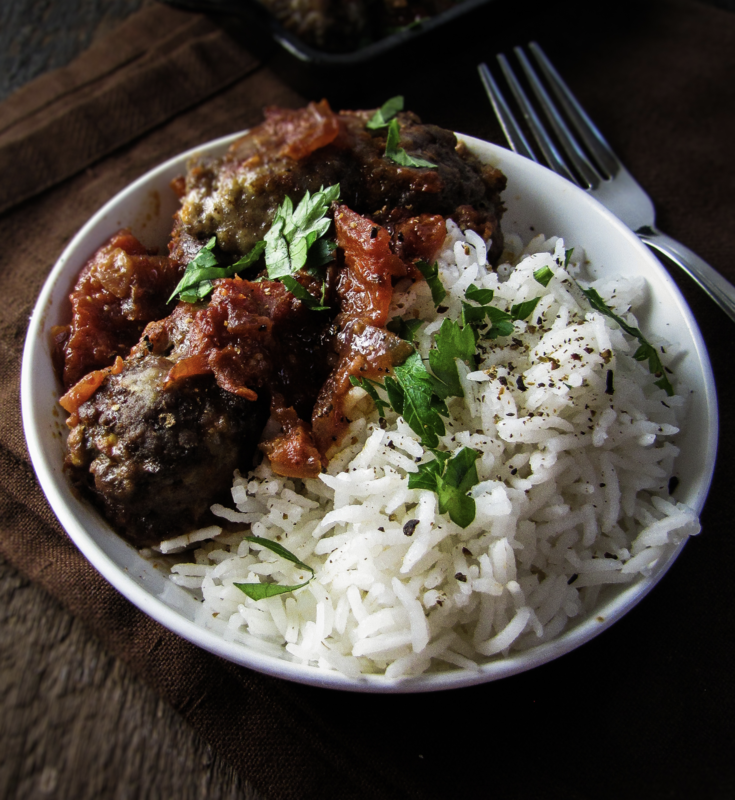 Remove cooked kofte from oven and add to sauce, mixing in if you like, or just placing on top. Whilst still on a medium heat make space to crack 4 eggs into the tomato sauce and place a lid on the pan immediately. Let the eggs cook for approx 5 mins, if not quite cooked after that time, let finish off in oven. Serve with Greek yoghurt sprinkled with cayenne pepper (to taste) and zucchini fritters (see recipe below). In a medium bowl, combine the courgette, eggs, onion, flour, parmesan cheese, mozzarella cheese and salt. Stir well enough to distribute ingredients evenly. Heat a small amount of oil in a frying pan over medium-high heat. Drop courgette mixture by heaping tablespoonfuls, and cook for a few minutes on each side until golden. Keep warm in oven. This recipe is a great Italian risotto recipe which would pair together perfectly with the any Beef or Lamb sausage, however I think it would work with any of my produce – even the Bacon or Black Pudding! 1. Preheat oven to 180C, line a baking tray with the cherry tomatoes in a single layer and add the garlic cloves. Drizzle with 1 tablespoon of olive oil and season with salt & pepper. Roast in preheated oven for around 30 mins. 2. Remove tomatoes & garlic from oven and squeeze the garlic from its skin and roughly chop. Set aside. 3. Bring the stock to the boil in a saucepan and reduce the heat so it is gently simmering. 4. Whilst the stock is warming up to boiling, heat the remaining olive oil in a heavy based pan over a medium heat. Add the onions and cool for around 7 minutes, until the onion is soft. Add the rice and stir constantly to make sure the rice is coated in oil. 5. Add a ladleful of the simmering stock to the rice and stir until the liquid has been completely absorbed. Continue to add stock at small ladlefuls at a time, allowing the liquid to be absorbed until adding the next ladleful. Half way through start cooking sausages/bacon/black pudding to your liking. Each has a different cooking time, so aim to make sure it is finished when the risotto is, keeping warm if finished early. Cook the rice until firm and creamy. 6. Remove the risotto from the heat and add the garlic, basil and parmesan, stirring gently to combine. Add the tomatoes and fold through the rice gently. 7. Spoon into serving bowls and serve immediately, placing either your sausage / bacon / black pudding on top. 1. Prepare lentils to packet instructions (adding the bay leaves when cooking). 2. Heat 2 tablespoons of the oil in a large, heavy-bottomed saucepan, add the sausage and brown whilst stirring frequently. Remove the sausage to a cutting board and cut into smaller pieces. Reserve on the side. 3. Add the onions, garlic and bacon to the saucepan and cook over a medium heat, stirring occasionally. 4. Add the rest of the vegetables, along with the stock and lentils in their cooked water and bring to the boil. 5. Bring to a simmer and let it cook for 45 minutes. 6. 15 minutes before serving add the spinach and stir. Check for seasoning. 7. Serve with bread and a sprinkling of parsley. Whilst using beef or lamb sausages is not essential, it is recommended. If you prefer you can twist and snip them into 3rds before cooking. If so, you do not need to slice them afterwards. If using a thicker sausage I would serve them whole. I used 2 ‘Suppengrün’ bunches for my vegetable mix instead of carrots, but the celery was separate. Try using a home made stock if possible. I used one from when I boiled some beef with some vegetables and it was perfect. 1. Gently squeeze sausages in the middle then twist and cut each one in half to create 12 mini sausages. If using pork sausages take extra care, or cook sausages first then cut them and add them at step 3. 2. Heat the oil in a frying pan, then soften the onions, red pepper, garlic and coriander stalks for 5 mins until soft. Add sausages and cook until browned. 3. Stir in the tomatoes and let it simmer for 8-10 minutes. 4. Using the back of a large spoon, make 4 dips in the sauce, then crack an egg into each one. Put a lid on the pan, then cook over a low heat for 6-8 mins, until the eggs are done to your liking. Scatter with the coriander leaves and serve with crusty bread. 3 leeks, white and light green parts only, halved lengthwise and cut into 1 inch pieces. Preheat over to 180C. Line a large baking tray with foil and set aside. Prepare the leeks in 3 tablespoons of olive oil with salt and pepper. Spread over the baking tray and roast for 10 minutes. Add fresh thyme and parsley (to taste) to the remaining olive oil and then add chopped apple and evenly mix. Add the sausages and apple to the baking tray and cook for a further 25 minutes until sausages are nicely brown. 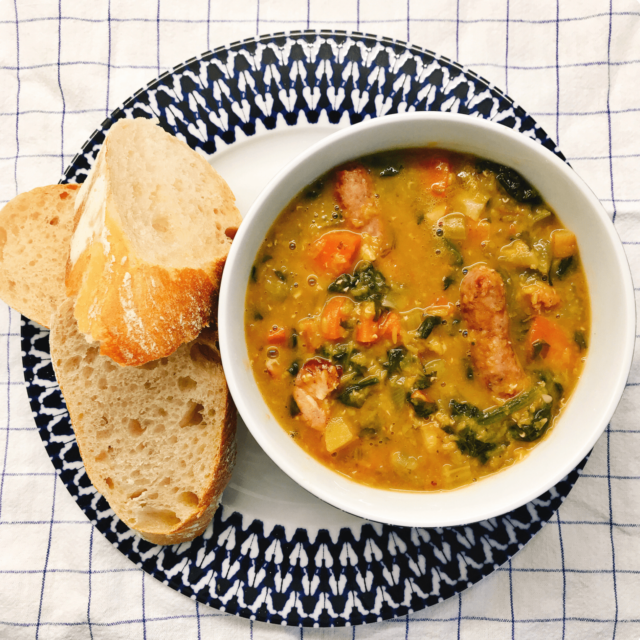 Serve at once, with crusty bread to soak up all the lovely baking juices! Scrub sweet potatoes, (leaving the skin on) into small cubes. 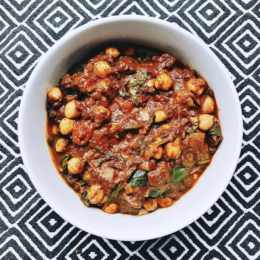 In a large bowl, add a few tablespoons of the harissa paste (note: each harissa is different, so taste before you add to check how spicy it is). If too spicy dilute a little bit with olive oil. Make sure sweet potatoes are coated well. Salt and pepper to taste. Place on a parchment liked baking sheet, making sure they are not too crowded. This will allow them to crisp, rather than steam. Stir after 15 minutes. Check again after 10 minutes. Roast until crisp and tender. While roasting, brown Merguez sausage in a skillet. You can either serve them whole, or pinch and twist in the middle, then cut in half to make smaller. If you like, you can also just use the meat from the casings, pressing it out like a tube of toothpaste. Saute some onions together with however you decide to use your sausages. 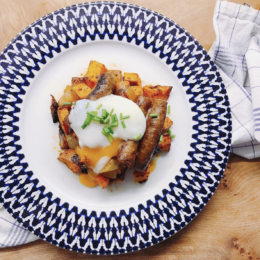 Remove the sweet potato hash from the oven, and fold into the skillet along with the sausage and onions, and mix. 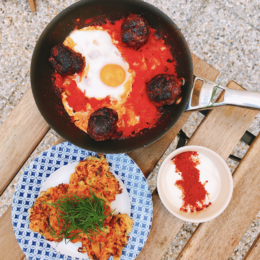 Gently place eggs over top, garnishing with fresh chive or coriander (and if you like, more harissa). Heat the oil and fry onions over a low heat for 10mins or until very soft but not coloured. Increase the heat slightly and fry for a further 4-5 minutes until onions begin to brown, stirring constantly. Blitz the apricots and figs in a food processor or finely chop. Add the apricots, figs and raisins to the pan and cook for 2-3 minutes or until dried fruit begins to soften. Sprinkle over the sugar, add the vinegar, spices and season to taste with salt and pepper. Stir well and bring to gentle simmer and cook for 30 minutes stirring often to make sure the chutney does not stick and burn at the bottom of the pan. If the chutney gets too thick, add a little water. The chutney is ready when the liquid has reduced so that it is the right consistency. Remove from heat and set aside to cool. As the chutney cools stir it a little to distribute the moisture. Spoon the chutney into sterilised jars. This amount makes 1-2 jars – I usually make double and keep it in the fridge. Leave the chutney to mature for a couple of days before using.